The UK’s most successful hitmaker, Cliff Richard, is returning to Scarborough, Cartmel and Greenwich after sell-out shows in 2017! 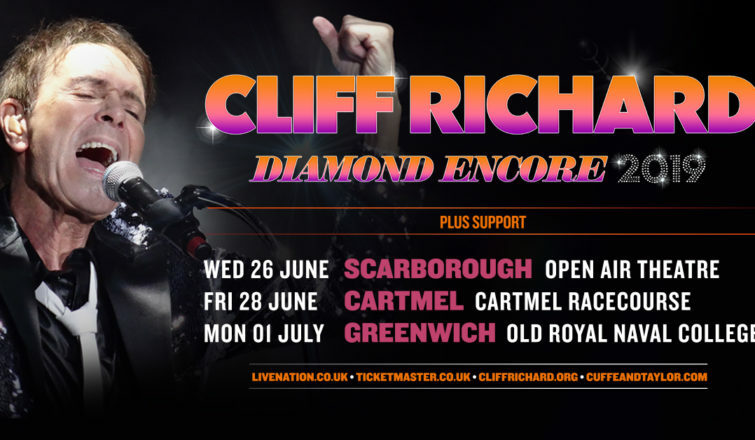 It is announced today that Cliff will headline Europe’s largest open air arena on Wednesday June 26th, followed by a live show at Cartmel Races on Friday 28 June 2019, and a very special concert on Mon 1st July 2019 as part of Greenwich Music Time. The shows come as the singer is celebrating the 60th anniversary of his first single Move It! being released. In 60 years, Cliff has recorded almost 1,300 song titles, composed 100 songs, achieved 14 number one singles (40 Top 5, 68 Top 10, and 96 Top 20), and seven number one albums (28 Top 5, 44 Top 10, and 53 Top 20). Move It!, where it all started, is the most recorded song in Cliff’s back catalogue, numbering 23 different versions. Able to change with the times and tastes and remaining hugely popular, Cliff nonetheless has stayed faithful to his rock and roll roots throughout. Because, when many people would be thinking of retiring or settling down to a quieter life, Cliff Richard continues to draw massive crowds to his concerts and regularly reaches the top ten with his albums. Not bad for someone who critics thought wouldn’t last way back in 1958! Tickets for the concert race day and June meeting go on sale on Sunday 18th November via www.cartmel-racecourse.co.uk where a full list of summer racing fixtures for Cartmel Racecourse can also be found.